Welcome to Hostel Dar Jannat! 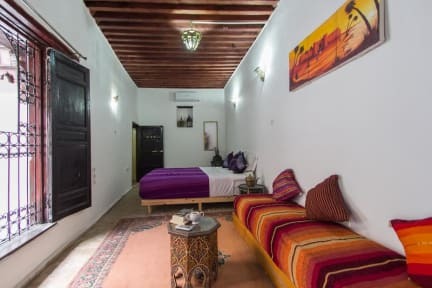 Mingle with culturally curious travellers in a laid back, authentic Moroccan setting! Watch local Fassi artisans trade their handicrafts, hear the Call To Prayer reverberate around the ancient Medina of Fez from our rooftop tent & breathe in air aromatic with Moroccan spices. Just a 5 minute walk from Bab Boujloud (Blue Gate), the main entrance to the medina, we are between the main street of Talaa Sghira and Talaa Akbira. 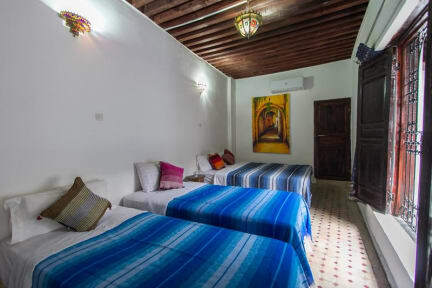 Hostel Dar Jannat is ideally located for easy access to souks, artisan shops, restaurants, taxis, banks and the hustle and bustle of ancient Medina.